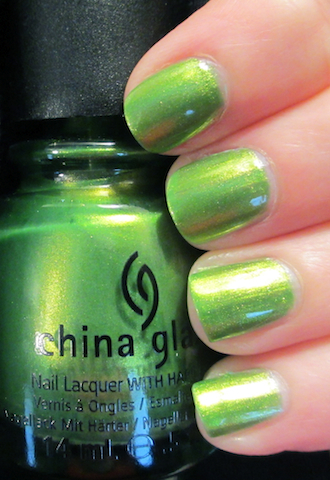 I've had China Glaze Cha Cha Cha on my wish list since it came out in the 2011 Island Escape Collection. I'm a sucker for greens and I love this lime green with gold micro glitter. I used 3 coats here as one or two were a little too sheer. That's what happens to me when I read blogs:) I hope you like it if you decide to pick it up! I know, now that I see the rest, I could probably use a couple more! So pretty! I wonder if it would be good for stamping. It look very metalic in your pic. Thanks:) I'm not sure, I've never done stamping but it's more shimmery than metallic. It's worth a try:) If you try it, let me know and I would love to see it. I love love love Cha Cha Cha!